Seagate has formally introduced a new family of hard drives in the 2.5” form-factor. It is designed for laptops as well as external storage solutions. The new BarraCuda HDDs are based on 1 TB shingled magnetic recording platters and Seagate’s multi-tier caching technology. They enhance the maximum capacity of the company’s 2.5” HDDs to 5 TB - making the BarraCuda ST5000LM000 the world’s highest-capacity 2.5” hard drive. 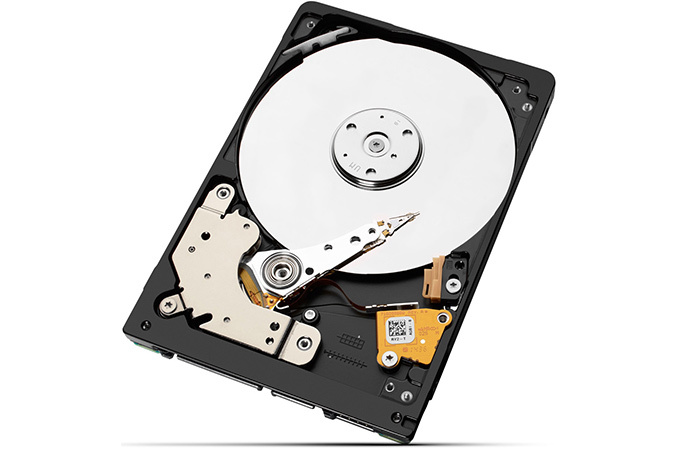 The new Seagate BarraCuda 2.5” drives resemble the company’s Mobile HDDs introduced earlier this year and use a similar set of technologies: motors with 5400 RPM spindle speed, platters based on shingled magnetic recording technology with over 1300 Gb/in2 areal density, and multi-tier caching. The 3 TB, 4 TB and 5 TB BarraCuda 2.5” HDDs that come with a 15 mm z-height are designed for external storage solutions because virtually no laptop can accommodate drives of that thickness. Meanwhile, the 7 mm z-height drives (500 GB, 1 TB and 2 TB) are aimed at mainstream laptops and SFF desktops that need a lot of storage space. All the new BarraCuda 2.5” HDDs feature 128 MB of DRAM cache as well as multi-tier caching (MTC) technology, which is designed to hide peculiarities of SMR. Hard drives featuring shingled recording write new magnetic tracks that overlap part of the previously written tracks. This may slow down the writing process since the architecture requires HDDs to rewrite adjacent tracks after any writing operation. To “conceal” such peculiarities, Seagate does a number of tricks. Firstly, it organizes SMR tracks into bands in a bid to limit the amount of overwriting. Secondly, the MTC technology uses several bands of PMR tracks on the platters, around 1 GB of NAND flash cache as well as DRAM cache. When workloads generate relatively small amount of writes, the HDD writes data to NAND and/or to the PMR tracks at a predictable data rate. Then, during light workloads or idle time, the HDD transfers written data from the caches to SMR tracks, as described by Mark Re (CTO of Seagate) earlier this year. To a large extent, Seagate’s multi-tier cache determines the performance of the company’s BarraCuda 2.5" and Mobile HDD drives. For example, when Seagate announced its Mobile HDD products earlier this year, the company declared maximum sustainable transfer rate of the HDD at 100 MB/s. However, the documentation was altered later in the summer to reflect a maximum transfer rate of 140 MB/s (possibly due to updated firmware, or a change in the performance measurement method). Now, the high-capacity BarraCuda 2.5” (3 TB, 4 TB and 5 TB) drives are rated for 130 MB/s, while the mainstream BarraCuda 2.5” (500 GB, 1 TB and 2 TB) are rated for 140 MB/s. This is still below the 145 – 169 MB/s offered by PMR-based Laptop HDDs from the company. *While the vast majority of the Seagate BarraCuda 2.5" 4 TB HDDs will use a four-platter configuration, some Seagate customers have apparently requested a five-platter configuration. Obviously, being based on 800 GB platters, such drives have lower areal density and, perhaps, different performance and behavior. Seagate’s new BarraCuda 2.5”/7 mm HDDs for laptops should hit notebooks in the coming weeks as the company is already shipping them to its customers. Seagate does not currently offer SED and FIPS options for its BarraCuda family (those who need encryption can still get Seagate's Mobile HDDs based on SMR technology). The company plans to add these technologies to the BarraCuda arsenal in the future. The BarraCuda 2.5”/15 mm drives for external storage solutions will be used inside Seagate’s own DAS devices such as the Backup Plus Portable Drive and the Expansion Portable Hard Drive products. The Seagate Backup Plus Plus Portable Drive 5 TB (STDR5000100) is due in early November and will cost around $150 - $160. This device will be the world's highest-capacity portable DAS and will not immediately have direct rivals in this particular form-factor. At present, the maximum-capacity 2.5” HDD offered by Western Digital is 4 TB with a 12.5 mm z-height. It is used inside a number of My Passport drives. All the BarraCuda 2.5” drives are backed by a two-year warranty. Manual will be shortly updated - We have confirmation from Seagate that these are SMR drives. "Perpendicular Recording Technology" is technically the correct descriptor for the "recording heads/media" in the drive. Shingled Magnetic Recording means overlapping tracks of "perpendicular recording technology". We'll update the manuals to be clearer. The drive has our proprietary "Muti-Tier Caching Technology", MTC Technology (TM) that allows us to manage data flow in various storage devices present on the drives - DRAMs, NAND, legacy perpendicular recording zones, and shingled perpendicular recording zones - and the MTC Technology largely makes the underline technology less of a factor. All SMR are PMR. But not all PMR are SMR.